Updated with contributions from PHGS users. The cemetery in Whites Corners was incorporated in 1870 on land originally owned by Miles White, the second sheriff in Potter County. Application was made to the Court in September 1870 by William J. Latta, James Ladd, and others for a charter to incorporate the White's Corners Association in Harrison Township. ALTHOUSE, Frances. Born 1914, died ?? BAKER, Satie (Kibbe). Spouse of Schuyler M. Born 6-7-1853, died 5-31-1935 - Dau of Tom Kibbe. Wed 3-3-1875. BARTOO, Sarah L. Born 1-28-1867*, died 3-13-1867. Age: 1 m 16d - Dau of W. and M. Bartoo. BELCHER, Emily. Spouse of Samuel. Born 12-10-1840, died ?? BELCHER, Samuel. Spouse of Emily. Born 4-5-1836, died 4-5-1900 - Civil War Vet, Co G, 46th PA Vols, Pvt. BLEND, Susannah M. Spouse of Hiram. Born 6-1885, died 7-1875. Age: 26 - First wife of Hiram. 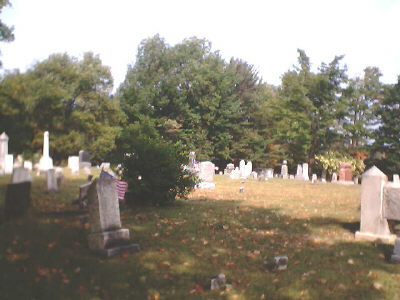 Hiram buried in Potter Brook cem. BOSLEY, John T. Jr. Born 2-23-1964, died 12-15-2007. Age: 43 - Son of John T. Sr. and April (Dill) Bosley. Born in York PA.
BURTIS, Julia (?) Burtis. Spouse of ? Burtis/ Woolsey. Born ? ?, died 12-26-1875 - Second wife of Woolsey. Wed 10-5-1870. BURTIS, Woolsey. Spouse of Mary J Potter/ Mrs. Julia Burtis/ Mrs. Sarah G. Taggart. Born 3-31-1822, died 8-8-1896 - Son of Solomon and Rebecca (Rose) Burtis. Married to Mary Jane in 1850. (1850 Harrison Census) Wed Julia 10-5-1870. Wed Sarah 7-16-1876. CADY, Carol. Spouse of Robert L. Born 1938, died ?? CARY, Jeanie. Born 1938, died ?? CHAPIN, Hiram O. Spouse of Mary A. Kane. Born 1843, died 1903 - Wed 1868, two daughters. - Civil War Vet, Co E, 1st N Y Dragoons, Pvt. Mustered out with Company, 6-30-1865. CHAPIN, Mary A. (Kane). Spouse of Hiram O. Born 1850, died 1933 - Wed 1868, two daughters. CLARK, Ernest R. Born 9-26-1919, died 4-8- 2001 - [A Loving Father and Grandfather. ] - WW II Vet, US Army Sgt. CLARK, Irvin C. Born 7-5-187? *, died 9-26-188?. Age: 3y 2m 21d - Son of A.L. and J.H. Clark. COOK, Mabel R. (Thompson). Spouse of Lester. Born 7-29-1920, died 6-10-2003. Age: 82 - Dau of Thaddeus L. and Emma M. (Brooks) Thompson. Wed 11-28-1953 in Binghamton NY, no chldren. COSTON, Nancy D. Born ? ?, died 6-25-185? COURTRIGHT, Julia. Spouse of Charles H. Born 6-16-1843, died 1-189? DIBBLE, Lyman. Spouse of Rosetta Robinson. Born 1843*, died 10-9-1874. Age: 41 - Son of Eber and Mariam (Dennis) Dibble. DOWNEY, Clarence. Born 6-17-1880*, died 8-9-1880. Age: 1m 22d - Son of C. Elmer and Loretta Downey. DOWNEY, Hannah. Born 12-17-1811, died 7-27-188? DOWNEY, Loretta ( Smith). Spouse of C. Elmer. Born 12-6-1863*, died 8-9-1880. Age: 16y 8m 3d - Dau of James and Sarah Smith. ELWOOD, Nancy. Born 1796*, died 4-13-1874. Age: 78 - Sister of Polly Warner. ERVAY, Christeen (Arter). Spouse of Ivan. Born 1780, died ?? - Born in NJ. ERVAY, James Franklin. Spouse of Louisa Schnable. Born 1849, died 1935 - Son of George K. and Sally A. (Paul) Erway. ERVAY, John [Ivan]. Spouse of Christeen Arter. Born 1780, died ?? - Born in NJ. ERWAY, Ambrose D. Spouse of Alice. Born 1841, died 1923 - Civil War Vet, Co I, 189th NY Inf, Pvt. ERWAY, Harriet (Hurlbut). Spouse of Parley P. Born 9-9-1815*, died 9-30-1877. Age: 62y 21d - (1850 Harrison Census) Dau of Giles and Jedidah (Metcalf) Hurlbut. Born in Broome Co. NY. FLETCHER, Armente E. [Kate]. Spouse of Nathan H. Born 1855, died ?? FLEWELLYN, Arnold. Spouse of Eva. Born ? ?, died ?? FLEWELLYN, Charles J. Spouse of Grace Woodward. Born 1894, died ?? FLEWELLYN, Craig A. Spouse of Catherine Stiles [Kay]. Born 1-1-1926, died 5-2-2016. Age: 90 - Son of Charles J. and Grace (Woodward) Flewellyn, born and lived in Whites Corners PA, died in Bath NY. Heavy equipment operator and oil rig worker. Wed 11-9-1957 in Whitesville NY, six children. (She survives) - WW II and Korea Vet, US Army. 1944-1946 and in Korea 1949-1952. Purple Heart in Korea. HENDERICKSON, D. Born 1840, died ?? HENDERICKSON, M. Born 1845, died ?? HOUSE, Fred J. Born 5-21-1867*, died 5-10-1885. Age: 17y 11m 20d - Son of A. and M. House. HUFTELING, Stephen A. Spouse of Hattie. Born 1847, died ?? HUNTER, Charles E. Born 1841, died ?? - Son of ? Hunter and Sally (Craig) Hunter. (1850 Harrison Census) - Civil War Vet, Co K 149th PA Vols, 1st Lt. Promoted from 2d Lt. August 29, 1862 - discharged by Special Order on March 25, 1863. HUNTER, Effie. Born 9-23-1864*, died 12-11-1879. Age: 15y 2m 18d - Dau of Henry and Betsey (Outman) Hunter. HURLBURT, John W. Born ? ?, died 5-2-18?? HURLBURT, Ruth (Stebbins). Spouse of Homer. Born 11-23-1854, died 8-13-1913 - Dau of Harvey and Charlotte (Colvin) Stebbins. Born at West Union NY. Wed 7-4-1874. KIBBE, Chris L. Born 1971, died 2002 - Son of Gerald and Donna (Miller) Kibbe. KIBBE, David L. Born 10-22-1959, died 1-25-1960 - Son of Gerald and Donna (Miller) Kibbe. KIBBE, Malisa L. Born 7-25-1835, died 5-11-1898 - Dau of David and Emily (McNutt) Kibbe. KIBBE, Sherman E. Spouse of Lottie. Born 5-12-1865, died 4-29-1920 - Son of Thomas J, Sr. and Dorcas (Cotton) Kibbe. KIBBE, Thomas J. Sr. Spouse of Dorcas Cotton. Born 4-1-1828, died ?? - Son of David and Emily (McNutt) Kibbe. (1850 Harrison Census) Born in Washington Co, NY. - Civil War Vet, Co B, 171 PA Vols, Pvt. Discharged on Surgeon's certificate on January 3, 1863. Re-enlisted in Co 1 189 NY Inf, Pvt. KNIGHT, Leroy. Spouse of Marcella M. Born 1843, died 1902 - Civil War Vet, Co B, 86th NY Inf, Pvt. Wounded at Spotsylvania VA, discharged 9-21-1864. LATTA, James H. Spouse of Margarette Smith. Born ? ?, died 1896 - Wed 4-23-1848 at Harrison PA.
LATTA, Margarette (Smith). Spouse of James H. Born ? ?, died ?? - Stone unreadable. Wed 4-23-1848 at Harrison PA.
MCCUTCHEON, Hiram. Born ? ?, died Aft 1890 - Civil War Vet Co A, 97th PA Vols, Pvt. Discharged 2-17-1865. MCCUTCHEON, Randall L. [RJ]. Born 10-16-1987, died 3-19-2009. Age: 21 - Son of Randall L. and Bernice O. (Putman) McCutcheon. No wife mentioned, one son. Killed in ATV accident. MCDOWELL, Fanny. Spouse of J. McDowell. Born ? ?, died ?? MCLEAN, Myrtle M. Born 1904, died 1911 - Dau of C. S.and D. A.
METCALF, Fred H. Spouse of Betty M. Kibbe. Born 9-20-1925, died 8-10-2007. Age: 81 - Son of Clair and Mabel (Robbins) Metcalf. Born in Potter Brook PA, died in Harrison Valley PA (at home), Wed 3-25-1950 in Harrison Valley PA, 3 children. - WW II Vet, US Marine Corps. MONROE, Mayjol M. Snay). Spouse of Harold H. Born 1915, died 1998 - Dau of Andrew and Clara (Stiles) Snay. NORTH, Irene M. (Dill). Spouse of Jerold L. Born 7-28-1937, died 12-3-2010. Age: 73 - Dau of Ralph Robert and Irene Mae (Brown) Dill. Born in White Hall, MD. Wed 11-4-1954 in Parkton MD, 2 sons. NORTH, Megan L. Born 10-16-1986, died 1-8-1987 - Gr-grandau of Kenneth and Lois (Steadman) Miller. OWEN, Marie (Outman). Spouse of John Gilkey. Born 9-06-1822*, died 11-11-1857. Age: 35y 2m 5d - Dau of Stephen A. and Susanna (Savage) Outman. PARKER, Louie. Born 1890*, died 9-28-1891. Age: 1 - Son of G A and E M Parker. Calculated birthdate. PEIT, Martha. Spouse of William. Born ? ?, died ?? PEIT, William. Born ? ?, died 3-27-187? PHELPS, Emily L. Born ? ?, died 11-24-18?? RILEY, Fannie (Statham). Spouse of John. Born 1856, died 1919 - [His Wife] Dau of Edwin and Esther (White) Statham. ROBINSON, Harriett O.(Lincoln). Spouse of Burr. Born 4-27-1839, died 4-28-1914 - Dau of Danford and Amy (Dibble) Lincoln. Wed 7-3-1857. ROBINSON, Lovell P. Born 7-1853*, died 1-22-1862. Age: 8y 6m - Son of Burr and Harriet (Lincoln) Robinson. ROBINSON, Waldo L. Born 1-1894, died 1916 - Son of Samuel M. and Addie (Stevens) Robinsion. ROSSA, Marie. Spouse of Jacob. Born ? ?, died ?? SAXTONS, Beverly J. Spouse of Edward H. Born 6-30-1924, died ?? SCOVILLE, Rosa B. Born 11-5-1872, died 8-24-1900 - Prob surnamed Crandall and first wife of Esca Scoville. SEELEY, Bryon Lee. Born 4-29-2001, died 5-5-2001 - [We trust our loss will be His gain] Prob Great GrSon of William B. Seeley. SEELEY, Kevin Michael. Born 6-11-1973, died 6-11-1973 - Grandson of William B. Seeley, Sr.
SMITH, J J. Born ? ?, died 1-8-18?? STATHAM, Clair, Rev. Born 1916, died 1989 - Son of Carlos [Carl] and Ida (Smith) Statham. STATHAM, Edwin. Born ? ?, died ??. Age: 2 - Son of Carlos [Carl] and Ida (Smith) Statham. STATHAM, James. Born ? ?, died 7-2-1883 - Son of Edwin and Esther Statham. STATHAM, Willard. Born 1891, died 1916 - Son of Edwin and Esther (White) Statham. STEADMAN, Angella. Born ? ?, died ?? STEBBINS, Charlotte (Colvin). Spouse of Harvey. Born 11-1825, died 5-14-1883 - Dau of Philo and Mary (Darling) Colvin. Four children. STEBBINS, Lindsay M. Born 5-1-2003, died 1-9- 2004 - Dau of Kurt E. Stebbins and Jennifer L. Haynoski. STEBBINS, Mary L. Spouse of Duane. Born 1930, died ?? STEVENS, Sarah A. (Stone). Spouse of Sylvester L. Born 8-12-1838, died 1-3-1897 - [Wife of] Dau of Thaddeus and Diana (Gill) Stone. WARNER, Earl. Spouse of Bessie Thompson. Born 1890, died 3-13-1909 - Son of W. H. Warner. Wed 1-1909. - Son of W. H. and ? Warner of Brookland. WARNER, Samuel. Spouse of Mary. Born 1803*, died 9-3-1884. Age: 81 - Son of Samuel and Mary (Jerome) Warner. Born in Hartford Co CT.
WARNER, Sarah M. (Costen). Spouse of William L. Born 1840, died 1913 - Dau of Frank Costen. WARNER, Vesta. Born 1887, died 10-22-1918 - Dau of W. H. Warner. WHITE, Jane. Spouse of Filman White/ John. J. Born 4-30-1830, died 8-1915 - Dau of Thomas and ? Hubbard, born in Cortland Co NY. One son with Filman. Wed brother, John, 3 daughters. WHITE, Nettie. Born 1870, died 2-5-1913 - Sister of Emma Monroe, a teacher. YOUNGMAN, Sophronia. Born ? ?, died 4-12-18? ?